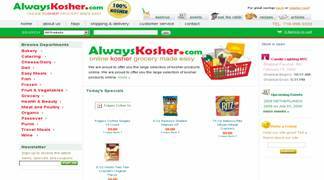 AlwaysKosher.com offers the large selection of kosher products online. It carries a full line of kosher food including fish and meats. The owners of this online-only business decided to have an e-commerce store to serve customers in Brooklyn, NY and surrounding areas. The website design allows customers to view products by category. The categories include(Grocery, Bakery, Produce and Appetizing) and the customers can order and pay online. Pages include Kashrus (definition of kosher foods), Events, Ask the Rabbi, Recipes and Articles. The site features an easy-to-use administration interface so that revisions can be made to content as needed.